Last year I took a long hiatus due to some health issues that I needed to tend to. While I was recuperating I was able to work on a few projects around our house that I hadn't had the energy to tackle before. I was able to take my time and some of the projects actually took several months to complete. 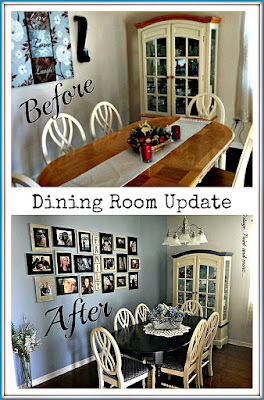 Today I want to share our dining room makeover with you - taking it from beachy to vintage on a budget. This actually took me about 5 months to complete. But I think it was so worth it. I am totally in love with the new room. Let's see what you think. The first thing we did was paint the room. Our living room and dining room are conjoined and actually make one very long room. So I painted all the walls with Lowe's Olympic Assure in a shade of gray called Fogswept Beach using a satin base. This is actually a gray with a hint of blue in it but in some lights, it actually has a lavender look to it. You can see it on the wall behind the china cabinet. 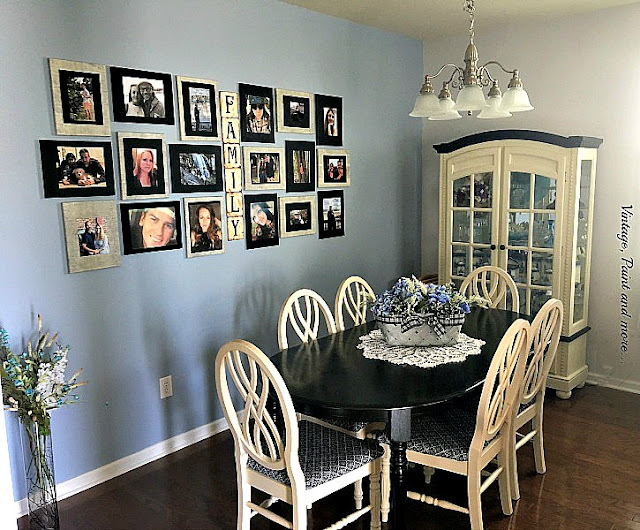 The wall that has the pictures is the first thing you see when you come in the front door. I wanted it to really pop so I painted it in Lowe's Olympic Icon in a shade called Behind Blue Eyes - a beautiful shade of blue - also in a satin base. We actually painted the living room, dining room, family room, hallway and kitchen in the Fogswept Beach - I just love it that much. It makes a beautiful neutral background that doesn't compete with the rest of our decor. The above picture is how the dining room looked before we started the makeover. You can see it still has the basic builder beige color on the walls. 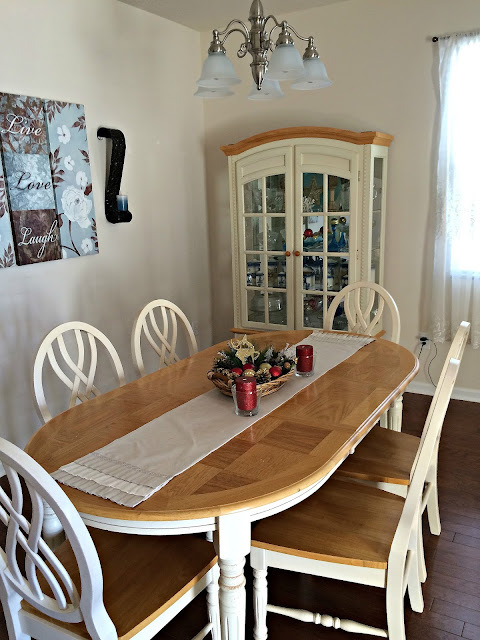 The table, chairs and china cabinet are very beachy looking and quite dated (I bought them during my beach craze). I actually purchased them from Craigslist when we first moved here 6 years ago. They were all in exceptional shape and I thought the price was just right. However, as time has passed so has my taste. After living in Florida for 18 years and here for 6 I am finally getting tired of the total house beach look and am leaning more toward a vintage industrial look. So, I decided it was time for a change. But like I said this set was and is still in exceptional condition so I decided to get out my trusty can of Rustoleum Black Chalk Board Paint and go to town. 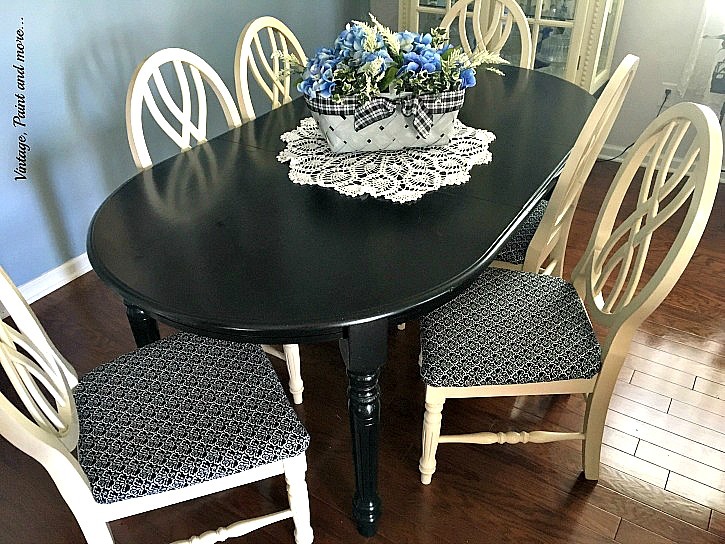 I decided to paint the table and leave the chairs unpainted - I really didn't want to sand all those areas and paint them. The trend today seems to be to have your table and chairs a bit miss matched and so I decided to try it. I love how it looks. I absolutely love this black table. My family was very skeptical about how a black table would look but when it was finished they were all very pleasantly surprised. Hubby really likes it. After painting it with 3 coats of black I let it sit and cure for about a week. (Remember I was also convalescing, not necessary 24 hours should be sufficient.) Then I did 3 coats of Minwax Polycrylic Protective Finish in Satin . This is giving it a great protective coat and just the right degree of sheen. Again not necessary to do three coats but it is our workhorse table and I wanted to be sure it was protected. It's been almost a year and you can see how nice it still looks. Oh, by the way, you can find directions for that pretty little market basket here. And if your lucky to find one at a thrift store for $.50 or already have one it won't cost you much at all. Next, I tackled the chairs. 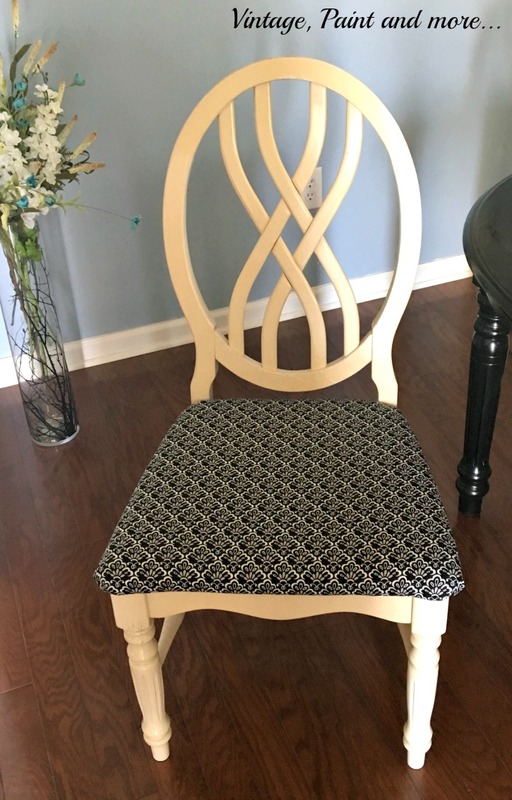 I searched for a fabric that I thought would not be too loud, would look somewhat vintage, and would pull the white of the chairs and the black of the table together so they looked like they had actually been purchased like that. I finally found the fabric at WalMart. They have a small shelf of coordinating decorative fabric that I really like. The quality is good and the price is right. so it was a no-brainer. I am going to do a post about how to upholster the chairs later. 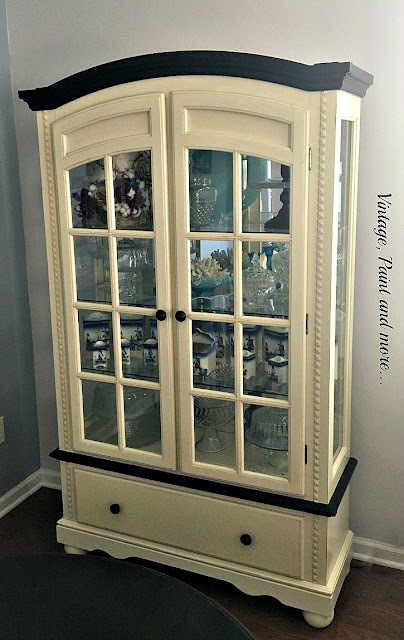 For the china cabinet, I actually toyed with the idea of painting it entirely black but then I changed my mind. Instead, I decided to just paint the light wood sections and the knobs. I am so glad I did I think it made it look so elegant just doing these areas. I was also going to paint the mirror in the back but decided not to at this time. But that isn't a promise it won't happen in the future - still on the fence with this one. And, here it is all finished. The gallery wall has taken me several months to complete and I am going to write an entire post dedicated to it alone. 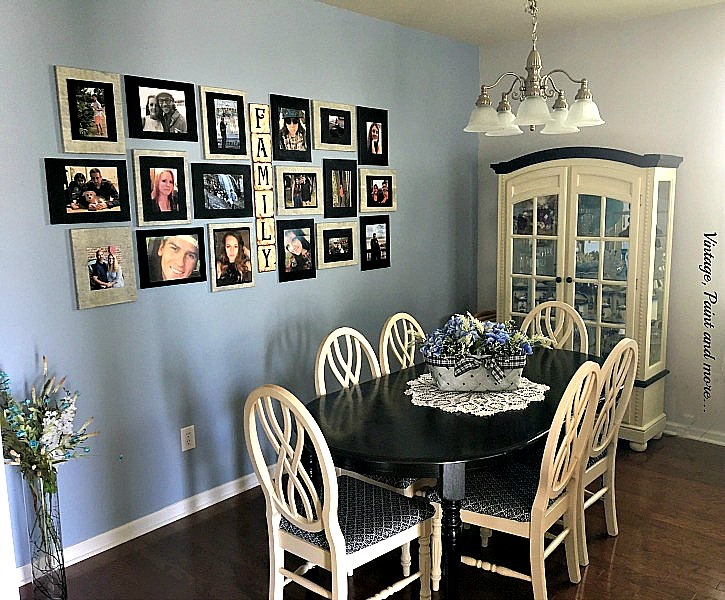 It's a very simple project that adds a lot of pizazz to the space it just took me a while to gather all the pictures I wanted to use. Since that wall is what you see when you first enter our home I really wanted it to stand out and I think it does now. I get so many comments on it from people who come to visit. The process from before to after took me several months of slow but steady work as I mentioned. However, that was because I would work a while and rest a lot. I love it all and am so glad I didn't listen to my family about the painting. I will be sharing my living room and kitchen over the next few week as I have done several projects in there also. So be sure to come back - you don't want to miss a thing. If you haven't signed up for my emails be sure to do so now. Right up there at the top you'll find a box to do so. What have you been up to lately? Would love to hear about it in the comments below. Until next time - have fun creating something you love. I will be linking up to the parties listed on the Where I Party page. 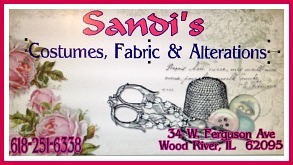 Be sure to stop by and visit these great parties - you won't believe all the great projects that are found there. Thank you so much, Mimi. I am so in love with this new look. I love your updated furniture! That looks beautiful now. The fabric on the seats is fantastic and goes so nicely with the room! 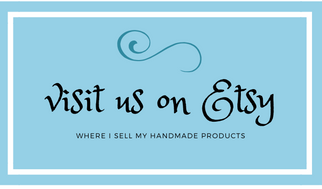 I am glad I found your site through the linky party! I will be back! Thank you so much. 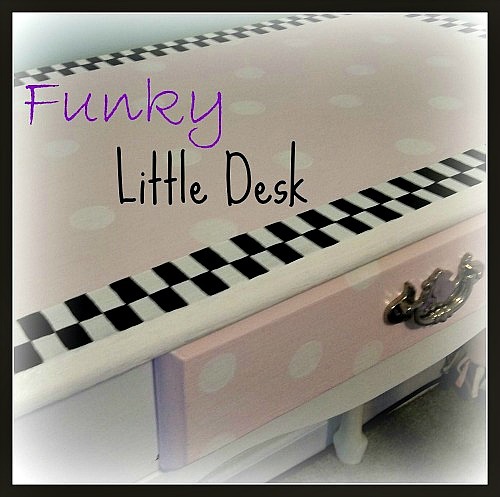 I loved working on this tired furniture and updating it. Hurry back there's more to come. 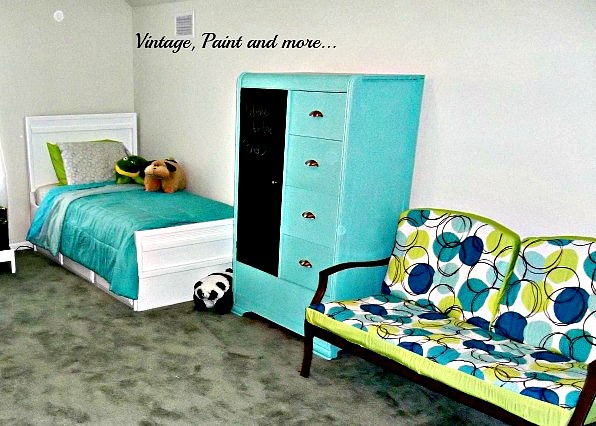 Great job on this room makeover. I like the table painted black, the pretty blue color that you chose for the walls, and the fabric for the chairs. It all looks great! Thank you, Carol. I was a little leary of painting it black but now I am so happy I did. I actually love this room now. Turned out great! 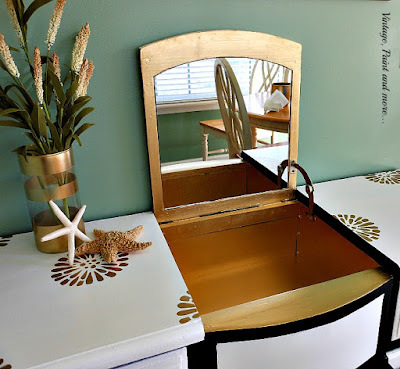 I love saving money by repurposing items you already have! Cathy, It really looks wonderful! Love the new colors. Thanks for sharing with SYC. Such a dramatic change. I would be so happy with something like that...you did a great job. You did a great job with this room makeover. I love the black table. Cathy, I love the room and the table looks amazing and goes perfectly with the pretty fabric choice for the chairs! Thanks so much for sharing it with us this week on Brag About It! What a lovely new look! The fabric on the seats are great! I am sure you are loving the new look! Thanks so much for sharing at Celebrate Your Story! Hi Cathy, just wanted to let you know your lovely dining room update will be featured at tomorrow's Vintage Charm party! Congratulations! 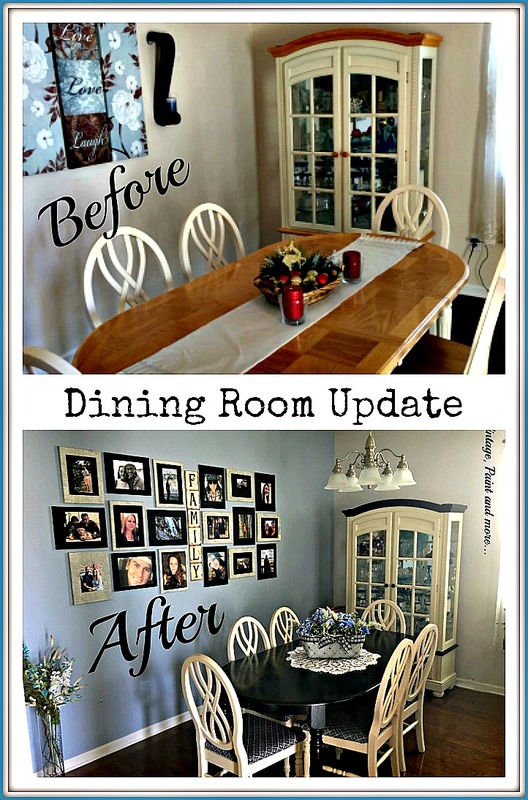 Cathy, your dining room makeover is lovely. I especially love the new look for the table. Thanks for sharing at Snickerdoodle. Pinning. I love your wall color and the fabric you used! This all came together beautifully! Hope your health is improving. Thanks for linking at The Gathering Place!